Last year, Samsung announced and released the i8510 (INNOV8) to consumers. Unfortunately, the device had quite a few 'holes' in its software that lead to highly frustrated users of the i8510 resorting to less-than-official methods of updating their firmware. However, with the release of the i8910 HD inching closer by the minute, Samsung have finally provided the public with an official guide on updating their phones at home. I was able to get to a United Kingdom software update website by changing one of the URLs given in Samsung's guide. If there's anyone in the UK with an INNOV8 willing to test, please report back. 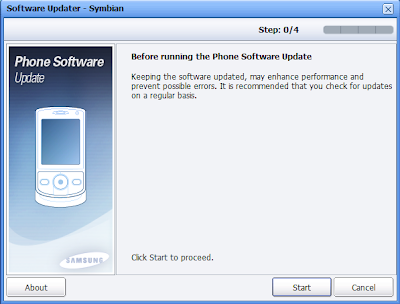 One thing I noticed was that unlike NSU (Nokia Software Updater), Samsung's software updater has a recovery mode available in case your software update is interrupted or fails. Thanks to Sammy's Ben Morris for writing the guide. The PDF file can be downloaded from Samsung's Mobile Innovator website (Samsung, if you're reading this, PLEASE fix Lab.dev!) here. You'll need to be registered on Mobile Innovator to download the PDF file but if you don't want to bother, I've uploaded the guide to a seperate mirror here. I don't know what's better; large tech sites full of mediocre posts or smaller blogs with less yet INCREDIBLE news? Thanks for the kind words, Jonathan! Let's just hope that Samsung gets plenty of updates out to users. i think another time samsung will support indonesia. Hi there...i have been trying to update my Samsung i8510 for a while...i even got a new phone as i gave up on my Samsung. I am in the UK, and my samsung easily loses network bars on regular basis. Is that due to the software...because technicians said it has nothing to do with my hardware. Hi I have never used the features on my phone until now. I got interested in using a SIP connection on VOIP and also using Fring. However, I came across several bugs. There is a bug in the built in SIP stack setup which will not make the connection to the remote VOIP server and there is a bug in Applications/ Applications manager. Preinstalled Fring cannot be uninstalled because it shows up nowhere except as an icon on Applications. Now I desperately need new firmware for this rotten designed phone. If only I had had less courage and got the Iphone instead of this piece of junk, I would not be wasting days trying to figure out how junk works! Yet I am not ready to ditch it, YET! I have the UK version (so I think- I bought it off a UK purchaser). Can anyone help with finding out where the phone is from (I think it is UK because it came with those oversized square plugs that only work in UK, Ireland, Singapore, that I know. Then once we know where it is from, I'll need upgraded firmware. Any help with this? So i presume Slovenia doesn't have an official up to date release yet or has something changed in the meantime?